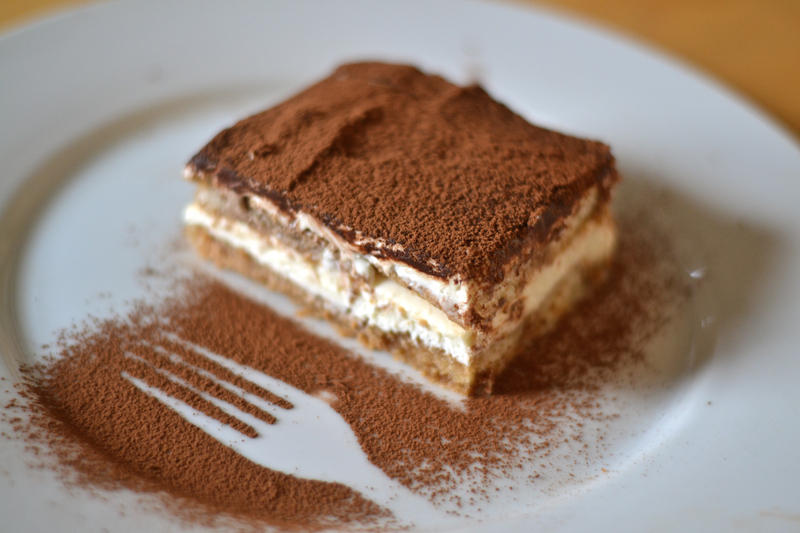 Italian for ‘pick me up’, tiramisu is my go to dessert when I am craving a simple comfort food. This Italian treat is a luxurious blend of coffee-soaked savoiardi layered with creamy mascarpone, finally topped with a heavy sprinkling of cocoa. Ideally, this super easy dessert should be made the night before to leave the fine flavours to seamlessly blend together. Combine the espresso with the marsala in a bowl. Add a tablespoon of icing sugar if you prefer the coffee mix sweeter. Place the sponge fingers into the liquid for 2 seconds each side until damp. Take them out of he liquid before they go too soggy then line the bottom of a square 22cm dish with a layer of the sponge fingers. Separate the eggs. Lightly whisk the yolks and the caster sugar until light and fluffy. Add the mascarpone to the mix and mix well until it is creamy and thick. Whisk the egg white and gently fold into the mixture. Spread half of the mascarpone mixture over the sponge fingers. Add another layer of soaked sponge fingers and top with the remaining mixture. Dust cocoa powder over the top of the dish, then place in fridge to rest overnight. Looks fantastic- I love the combo of lightness & richness in tiramisu!